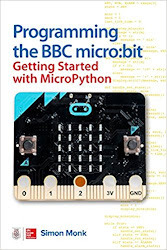 Open Source hardware, Arduino, Raspberry Pi, BeagleBone, DIY electronic construction, reviews, projects, how-tos and recipes. 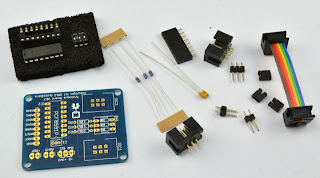 This is a review of the Quick2Wire Port Expander Combo kit and the Quick2Wire Analog Board. Both kits can be bought from a variety of sources, including CPC and SKPang in the UK. The picture above shows the main interface board complete with ribbon cable for attaching it to a Raspberry Pi's GPIO header. On the right is the Analog board. The port expander board (included in the 'conbo' kit with the huge interface board, is a similar size and all the boards have 6 pin headers for I2C designed to be daisy-chained together using the cables supplied. All three boards come as through-hole kits that are easy to assemble. Even easier if you rearrange the assembly instructions and solder the components in the order of those that lie lower to the boards first, rather than the apparently random order specified in the instructions. 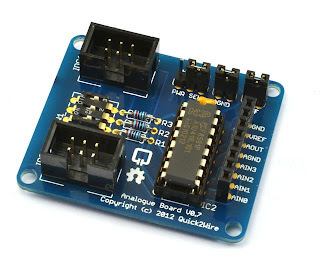 The analog board is a nice size and has the pair of I2C connectors, a DIP switch to select the I2C address and various other quite useful headers. Its always good to see how these things work, so I decided to try out an analog input, using just a pot (variable resistor). As you can see, a fair amount of desk space is required for this! The ribbon cables and sockets all have notches, so the only place that you beed to make sure you have the cable the right way around is on the Raspberry Pi. The pot is wired to the analog board with one wiper to VREF, the other wiper to AGND and the slider (middle connection) to AIN0. The AGND and VREF jumpers are both bridged and the DIP switches are in their original position. Quick2Wire have their own Python library, but being familiar with I2C, I decided I didn't want to figure it out, and just used the standard stuff. This tutorial will get you set up using I2C. This shows that the PCF8591 is on I2C address 48. If you have a revision 1 board use "-y 0" rather than "-y 1". The following code is lifted unaltered from GrumpyMike (Mike Cook) here. Just paste it into a file called "pot.py". Again, if you have an older revision 1 Pi, change bus = SMBus(1) to be bus = SMBus(0). Run the program and you should see a new reading every time you move the pot knob. DIP switches to select I2C address. The daisy chain I2C idea, lets see some nice displays etc. in this format please. I haven't mentioned that the expansion board also breaks out SPI and Serial connections from the Pi. Their own library for all the I2C things. The 'standard' code works fine. The interface is huge and largely devoid of any active components, it could easily be half the size. This has the potential to grow into a really nice system, a bit like .Net Gadgeteer for Pi. But if you just want to have analog inputs on your Raspberry Pi then just stick a PCF8591 chip onto some breadboard and use jumper wires! These are my books. Click on the image below to find out more about them. Great review - very balanced. Just a small note: you've specified that the test code should be pasted into a file called 'pot.pi' and I think this ought to be 'pot.py'. Well spotted - I will update it now.